1936 Zenith 10S160 Tonbstone style black round dail radio set. Shortwave bands were becoming very popular. Many maufacturers were offering many models with shortwave. 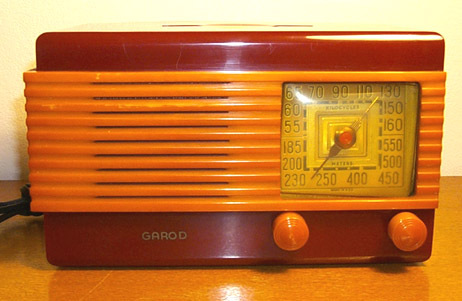 1940 Garod model 1B. 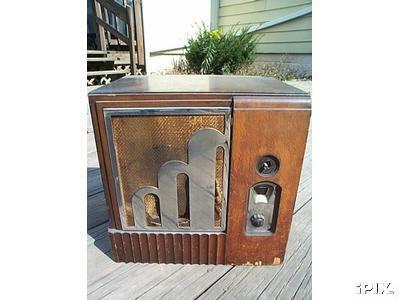 this is a Catlin plastic cabinet radio. 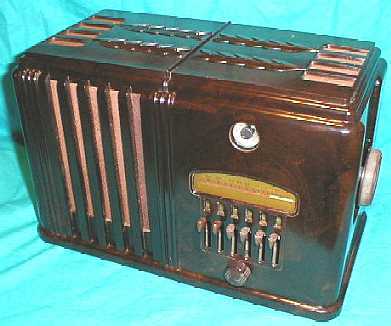 Catlin plastic radios are one of the early plastics developed during the 1930s. They are quite colorfull in style. Other plastics were used for cabinets starting in the 1930s. Catlin cabinets hadto be hand polished to give them thier glossy look. With low labor costs in the 1930s and before WWII this was cheaper then making wood cabinets. After WWII labor costs rose so Catlins were discontinued and other plastics took thier place. Majestic model 460. This 1934 model has interesting style. The m in the speaker grill. The bars wraping around the sides. Equiped with a tuning eye tube. Small style bezel around the dial window that looks like it was the type used on late 20s through early 1930s sets. 1938 Emerson Model Q188 Snow White repwood set. Emerson made a number of Disney novelty sets during the 1930s. On this page you can read and see pictures of the evolution of radio from the 1930s-1960s. We are in the 1930s. 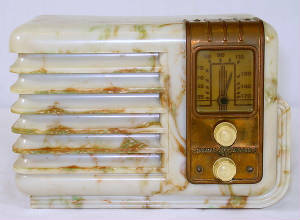 New materials for cabinet making,new styles of tubes,new tube types,and other events help change radio in the 1930s. 1930 RCA brings out the second generation superhetrodine. The Radiola 80 uses screengrid tubes. This radio out performed everything that was on the market at this time. 1931 newly developed tubes came on the market for ac and dc usage for automobiles. Numbers included types 36,37,38,and39. International iintroduces ac/dc sets that can operate on both types of electricity. Many rural spots in the country were still on dc. Jenson comes out with a new type of dynamic cone speaker with a pernament magnet. 1932 The depression deepens. 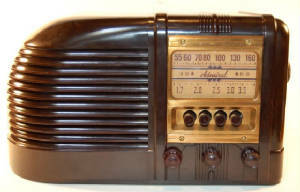 Radio sales hit thier lowest point during the 1930s. A new style of tube called the ST is released. The shape of the glass makes it stronger so the elements inside are stronger. Reduceses microphonics. 1933 RCA looses a court case. RCA must give up its sole control of the superhet patents. Westinghouse and General Electric have to stop building radios for RCA. RCA then starts building radios for GE the next three years.Multifunction tubes come out for sale. Types 2A7 and 6A7 are mixers combined with ocsillator allow less tubes in radios and lower costs. Radio sales start climbing. The depression hits bottom. Radio is free to listen to. First plastic cabinets are made. 1934 General Electric intoduces a new type of microphone. This mike replaces the old carbon mikes used in broadcast studios. This improved sound quallity. 1935 A new tube style changes radio again. metal tubes with 8 uniform pins with a key are brought to market. this quickens production time for the manufactures lowering costs again. 1935 Armstrong working at Columbia University developes Frequency Modulation. (FM) Armstrong builds test sets and has permision to use space in the top of The Empire state building from RCA for a fm transmiter. 1936 New audio output tubes come out. 6V6 6F6 raise output levels with good clarity. 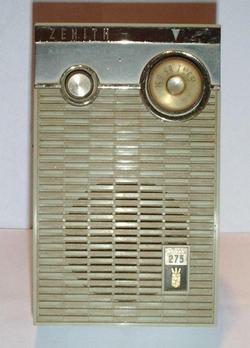 1938 RCA balks on fm GE buys a license from Armstrong and starts selling the first wideband fm radio set. Later in the year RCA tells Armstrong to remove his equipment out of thier space inside the Empire Stae Building. RCA sets up a TV transmiter to replace Armstrongs fm. 1939 New tube types again come to market. Glass octal base tubes replace metal types. Theese tube types are availible in 6 and 12 volt versions. 1940 Radio manufactures start offering enclosed cabinets because open backed sets effect sound quality. Miniture tubes for portables are released. 1R5,1U5,1T4 are some examples. Armstrong starts broadcasting FM on his own. He forms the Yankee Radio Network. Other radio manufactures sighn up and start making sets. RCA attempts to block this. AC/DC/battery portables come to market. 1941 January 1st the FCC allows FM to be broadcast on 40 channels between 42-50mghtz. December 7th the U.S enters WWII. 1942 radio manufactures go over to war production. No new radios for the public. FM radio sales at this point 350,000 sets sold. Armstrong starts court suit case against RCA for patent infringment rights. Armstrong freely gives the use to the goverment all his fm patents. 1943 David Sarnoff gets a commision in the Army. He becomes General Sarnoff. He goes to England and sets up the radio communicatios system fro the Allied invasion of Europe. Armstrong developes FM radar. He developes other FM radio equipment used in the war. Deforest almost kills himself and others when a demonstration of a radio controled bomb just misses the group. 1945 WWII ends Radios become availible to the public again. The FCC has been holding hearings on the use of FM frequencies. There is pressure from TV to change the band. (RCA) The FCC decides to change the band. FM radio is moved from 42-50mghtz to 88-108mghtz and TV got part of the old FM radio band. As a result all the old FM radio sets are now obsolete. 1947 Bell Labs announces the Transistor. New plastics are used for radio cabinets. Radios become much simpler with less conrols and knobs. 1948 A new type of five tube radio hits the market. Its called the all American five. This tube compliment would basiclly stay the same for several years. 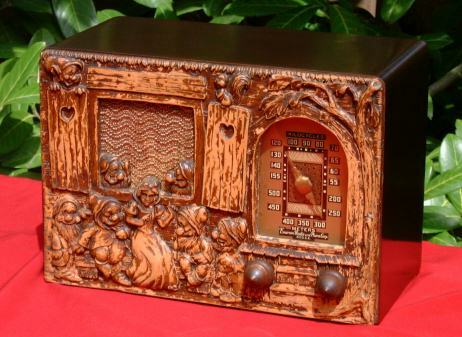 1953 Clock radios are becoming big sellers. A/C clocks become standard in them. 1954 Armstrong and JohnBose develope true FM multiplex stereo. 1957 Russia luanches Sputnik into Earths orbit. Its radio beep,beepbeep is heard around the world. Transister radio sales are increasing. Imports from Japan are now on the market. 1961 The FCC allows stereo fm broadcasting. First stereo fm radios are for sale. Telstar is launched by the U.S. Radio and TV signals can now be bounced between the U.S and Europe. 1967 The last Armstrong fm court case is settled. This was the longest radio legal case in history. Motorola was the last to settle. 1969 In July radio lands with men on the moon. Live TV pictures capture the event. 1938 Wards Airline Model 62-238 table set. Pushbutton tuning and a tuning eye help wth the tuning of this radio. Photo from Western Historical Radio Museum. Machine ag style also known as art deco is this Admiral bakelite table radio made in 1940.